Click the button below to add the Koa Lehua Hairbrush to your wish list. 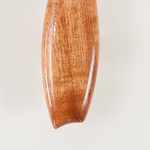 Our classic large oval hairbrush in choice koa wood, handmade in our Big Island shop. The heirloom craftsmanship promises many years of treasured service. I purchased three Lehua brushes that are absolutely beautiful. Crafted and finished with care they are a joy to behold. Shipping was prompt, arrived early. Packaging was very good. Gift box presentation was worthy of this special gift. Customer service was first class! My wife and daughters love them. Thank you! As a lover of koa, the brushes I got are beautiful and the women I'm giving them to will love them. This hairbrush is an absolutely beautiful piece of art. I'll use and cherish it daily for the rest of my life. I'm already thinking of which of my friends would appreciate one as a gift for a special occasion. What a refreshing change from the mass-produced junk that lines store shelves! Beautiful work AND it works so well. I got this as a gift for my (former) kama-ina lady friend who loves Koa. She is delighted with the brush. I have worked with my hands all my life and appreciate tools that are well made and fell good in the hand. This brush is one of them. Instead of 4 mediocre plastic things I now have one hand made beauty. beautifully crafted with love, the wood grain is amazing, this is something to be cherished and passed to the next generation. Mahalo to Dave and the ʻohana for your wonderful creations, thank you! Received brushes via mail. Shipping time was good. However, two of the brushes are missing pins. Not a good indication of how they will stand up. Koa is beautiful. Thanks for the feedback! Please note that there is a vent hole in the pin with ball hairbrush head. The "puka" (hole) is part of the design of the pnuematic head. It allows the brush head to breath and flex as the bristles are pulled through the hair.